...count to a hundred at least twice and skip count by hundreds to one thousand. It has become such a frequent pastime, that I have joked that there are too many numbers between 1 and 100. ...say he will do that when he is older, like 100. When he is 100 he will have to shave his face, get his drivers license and after that his keys, have a girl friend, and wear boxers. He has quite a few milestones to hit when he reaches 100 years of age. ...talk to you about the Seattle Seahawks. Much to my disdain, he has abandoned the Philadelphia Eagles to call a different team his favorite. Behr will tell you he switched because the Eagles are loosers (he used to say lossers) and the Seahawks are winners. I will tell you it is the result of peer pressure from one of his older friends, an avid Seahawk fan. ...talk about his dog. He doesn't have one yet, but he is planning all the details. ...correct your or catch you in a contradiction. Behr hangs on each detail someone gives him and when they don't make perfect sense he is not afraid to call you out. ...tell you he can read. His goal this past year was to learn to read. He has spent months working hard at it and now can read quite a few sight words and word families. Just wait until next summer. I hope his love for reading continues! ...count to 100 at least one more time. It is after all, his favorite way to pass the time. 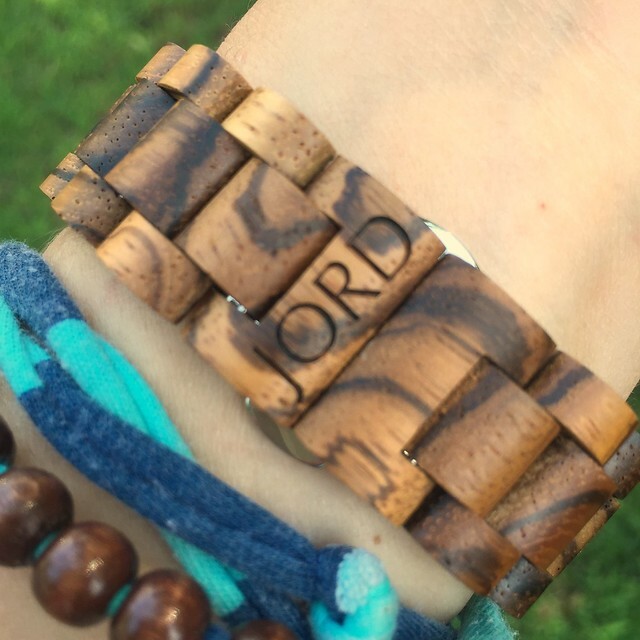 When I was first contacted by JORD to try out and share my experience with one of their wood watches, I was a bit skeptical. I'm not super into wearing things on my wrists. Plus, during the summer we spend most of our days near water. Why would I want a wood watch? Or so I thought. Then I looked at their website and I started to get really excited. I changed my mind about which watch I wanted to try about eleven times. I even told a friend I picked a watch completely different from the one I actually picked. 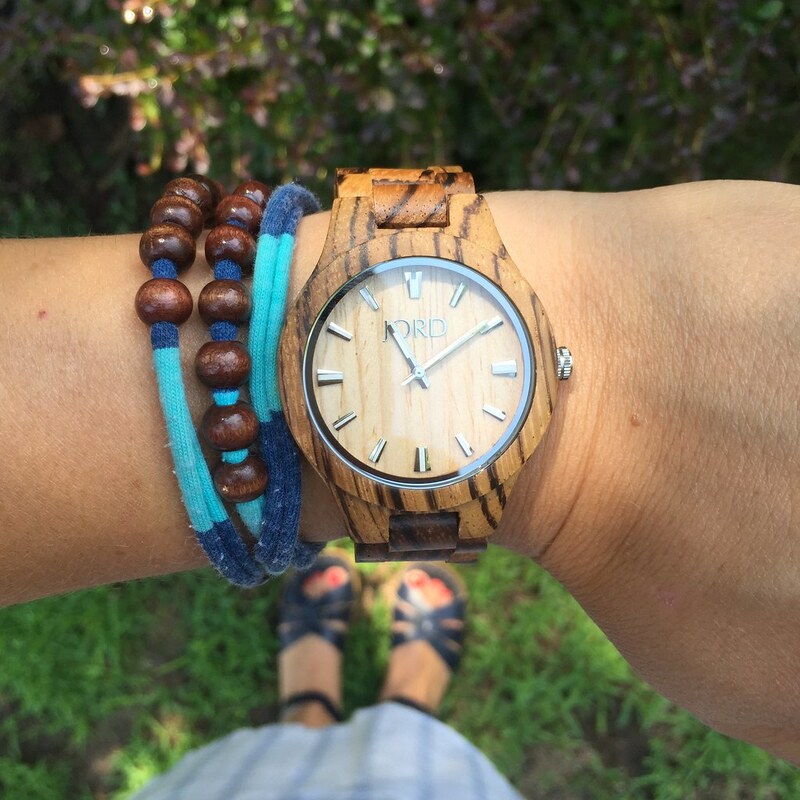 Ultimately, I chose the Zebrawood and Maple watch from the Fieldcrest Series. Then my watch came in the mail. It was a bit snug at first so I wasn't wearing it much. And then I unpacked the gorgeous box to take pictures and found extra links in the bottom. I have no clue why I didn't look right away, but I was thrilled that they were included and also impressed by this sign of quality. Once the extra link was in place, my watch took up residence on my wrist. I love it so much and simply take it on and off throughout the day if we end up near water. The colors are neutral but striking and the wood makes it very lightweight. Its actually perfect for summer, completely contrary to my initial thoughts. But you better believe I will be wearing it year round. The watch gets easily noticed without me noticing any added bulk to my wrists. Even when I am working at my computer, this watch rarely comes off. I love the details. I keep switching up what I wear with the watch on my wrist and even which wrist. I've traditionally be a left wrist watch wearer, but now I think my new watch is going to live on my right wrist. Look at me, I am a changed woman. (Yes, a tad dramatic, but I just have that many great things to say about this watch). These watches would make a great gift - anniversary, Christmas, graduation. Add them to your list. Your people will thank you. JORD provided me with this watch in exchange for this review, but the thoughts here are entirely my own. And I definitely started as a skeptic. My super fashionable sister also loved my watch so much when she saw it in person, she ordered her own! If you get one, I'd love to know which you pick and what you think. We have already been to the beach twice this year, unheard of for our family. We are totally beach people, but our trips generally fall later in summer. Rarely ever before July. Fortunately we picked the hottest summer ever for a few early trips. We are that family driving down the road that you know is bound for a good time, our roof rack is full, there are beach bags pressed up against the back window, boogie boards in sight, and stuff piled on our laps ready for excited times ahead. Can you picture us? If you aren't sure yet, I am an over packer. Don't let the picture above fool you! We bring the wagon, the scooters, the bikes, the beach toys, coloring books, cars and trucks, board games, tennis rackets and golf clubs. When we actually get to the going to the beach part, I again over pack. I haul down to the beach looking like I am ready to stay for a week. But I am slowly learning a few tricks that make our beach adventures easier. Here are my six non-negotiable items, with a seventh snuck in for fun. 1. // The perfect beach blanket (and this one looks awesome too!). I've been looking for a few years. Its thicker than a sheet, like a quilt without batting and it isn't hideous or overly florally. It is lighter and bigger that the sweatshirt blanket we have used in years past. 2. // Two towels. I have learned that with a good blanket, you need fewer towels. Rarely are both ever in use. Less towels means less to lug back and forth each day. At this point (with kids ages 2 & 4) if they are getting wet, I am not sitting in my chair anyway. I figure once they are old enough to carry their own towel across their shoulders, this number can increase. 3. // One bucket of toys (with a ball tucked inside the bucket). I've tried lots of toys and fewer toys and toys in bags, and so on. But I have realized that one bucket, which my boys can take turns carrying, is the perfect amount. And nothing else for them to play with. I have brought books and games, but really the only thing they do is dig in the sand, chase waves, or play catch. 4. // The ergo (I wish ours had this cool whale pattern). Sometimes to get the perfect beach nap, we still need the ergo for Hudson. I know this tool is fading, but it has joined us on every beach trip since Behr was born and I can't imagine not having this security blanket. The beach nap is the ultimate for any parent. The only way to actually rest on the beach is if your kids nap too! 5. // Rash guard. 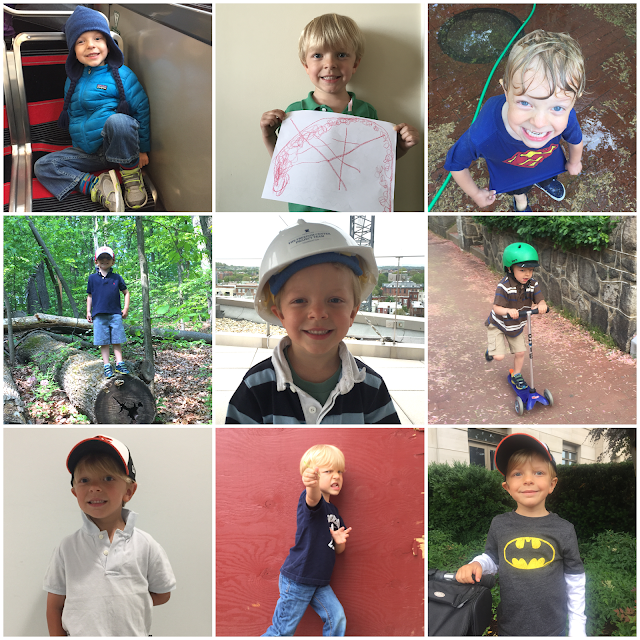 My boys have worn UPF rash guards since they started going to the beach or pool. But this year Mark and I have also added rash guards to our beach attire. Also, never before have I realized how much sun my boys get, even when I am being diligent with sunscreen (my favorite here). My boys love to be in the water, in the sun. And they don't have the same instinct as adults do to get under the shade of the umbrella. This summer we stocked up on rash guard from Land's End. I was shocked by how much I liked their quality last year and I almost forgot about it this year. Fortunately, their stuff is incredible affordable and well made. This is not a sponsored post, I just really, really love their rash guard (and bathing suits too). 6. // Cooler. 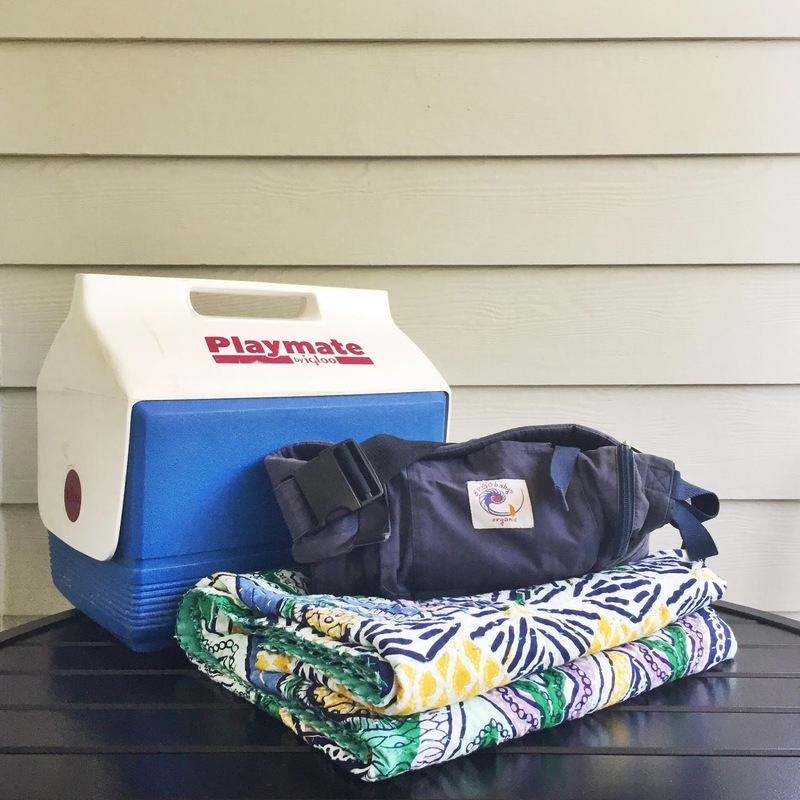 We have a soft-side collapsible cooler, but nothing beats the old school igloo playmate cooler my parents have. Too bad we don't have room for anything else in our car... And while we are talking about coolers, what are some of your favorite beach snacks? I love tuna sandwiches, potato chips, peanut butter crackers, and apples at the beach. How about you? What do you pack in your cooler for the beach? We are still figuring out the perfect beach umbrella, and frankly don't have room in our city apartment for beach chairs, so we always borrow them from our parents on our way. Here is a similar beach gear post I wrote in 2013 -- we did finally get the Sport-brella and are testing it out. The only down side so far, its huge, even when collapsed, so it hardly fits in our car! Due to family obligations and the cyclical nature of my work, January is a crazy month. I take time off blogging to focus on everything else in life. It gives me the benefit of a month of reflection. This year, it seems I needed two! A surgery and several ER visits, a road trip to Boston (see that snowy beach?) and all of the sudden, I lost February. Full knowledge that it's a short month didn't help it speed to a close with too many things left undone. You too? Okay, now to get productive in March. My goals are more precise then they have ever been before. Wake at 6 am each morning. Getting up first is paramount for a hope of a smooth day. When I am prepared, it benefits everyone in my family. Write three back dated blog post this month. 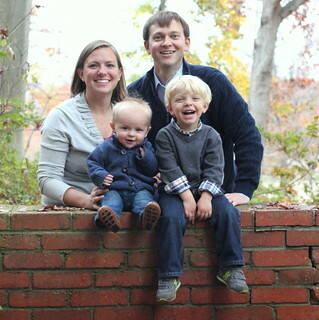 The primary purpose of this blog is family record keeping. If I am not keeping records regularly, it leads me to worry and impacts my productivity. Instead of reliving the details of Halloween 2013 (yes that long ago) in my head so I don't forget them, I need to get the memories down and move on. That way they are ready for me to go back to whenever I want. Read once a week. Somewhere in 2014 I got too busy to read. No more. Instead of collecting books on my nightstand, I'm going to start and finish them. I am not sure how many yet, but sitting down to read once a week, during day light hours, that's my goal. Phew. Hello March. Let's go! 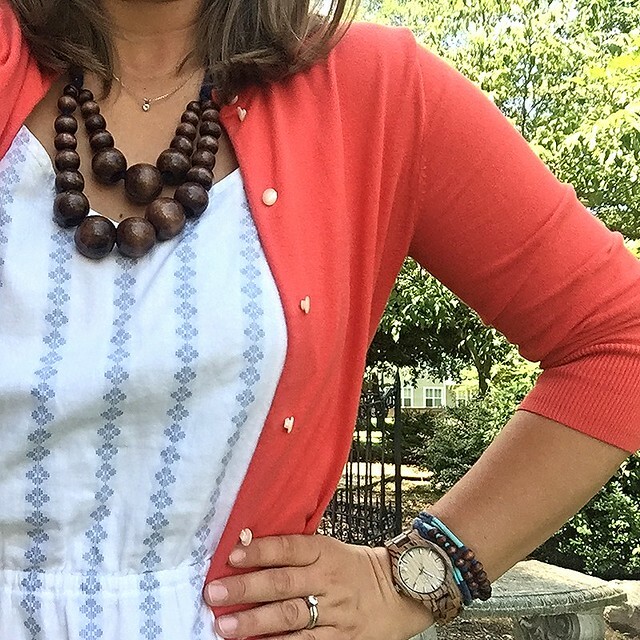 I'm linking up with Hayley for Goals with Grace. You can also catch some of my thoughts on hospitality over on The Orange Slate with my dear friend Emily.